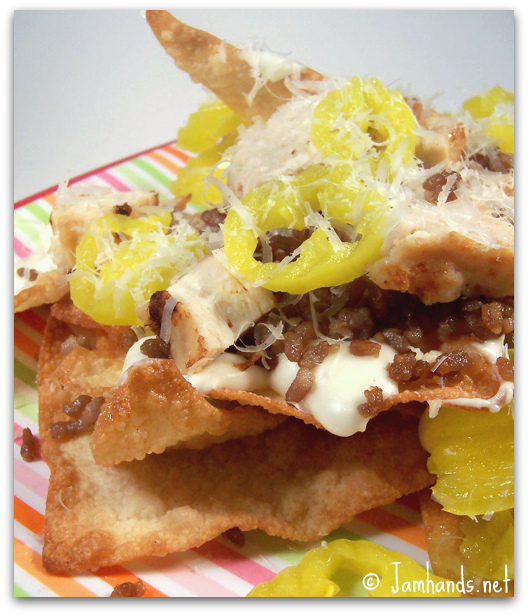 Italian Nachos - Crispy pasta chips baked with ground Italian sausage and/or sliced grilled chicken, pepperoncini peppers, black olives, roma tomatoes and jalapenos. Topped with creamy alfredo sauce, melted mozzarella and parmesan cheese. I think we got everything here except the black olives and tomatoes. This is so incredibly yummy. 1. In a heavy, medium saucepan melt the butter over low heat. Add the garlic and then the flour and stir to combine. Cook, stirring constantly, for 3 minutes. Increase the heat to medium and whisk in the half-and-half little by little. Cook until thickened, about 4 to 5 minutes, stirring frequently. Remove from the heat; add 2 cups of the grated Parmesan. Season with the salt, pepper and stir until cheese is melted and sauce is smooth. Cover and set aside. 2. Heat a heavy saucepan or deep fryer to medium. Cook the wontons until light brown. This only takes a few seconds per side. Set aside on paper towels to drain. 3. Pile the wontons on a large serving platter. Drizzle with warm cheese sauce. Add sausage, chicken, tomatoes, olives and peppers. Top with shaved Parmesan. Cheese sauce recipe by Michael Chiarello. Recipe put together by me. Came across this recipe the other day and the whole family LOVED it! Thanks so much! YAY! Bookmarking this for when I make these next week! :-) Thanks, Ali! Oh MY!!! Thank you so much!! I simply love these. This is what I get everytime we go to Johnny Carino's Country Italian Restaurant! I would love to share this on my blog as a part of my Weekly Menu!